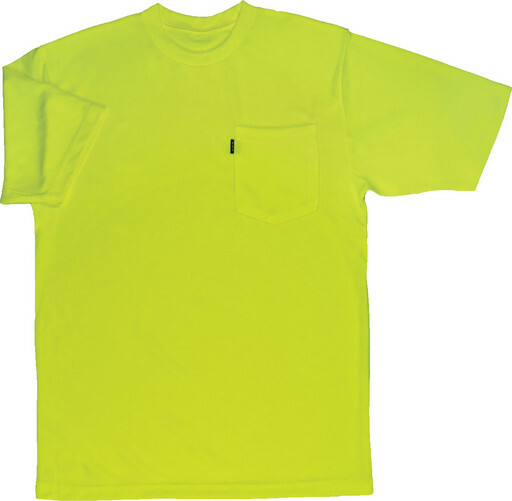 A KEY Short Sleeved Hi-Vis Pocket T-Shirt for coolness on the job. The #1 Choice when you rely on apparel that will allow you to be easily seen in risky situations, like road construction. When it comes to Safety on the Job only the Highest Quality Hi Visibility Work Wear should be chosen, like the KEY 838.39 Enhanced Visibility Long Sleeved Pocket T-Shirt. Being seen is extremely important on the road around large amounts of traffic. Remember workplace safety should never be compromised, always choose The Best High Visibility Apparel. This KEY Pocket T-shirt is 100% Polyester High Performance Waffle Knit designed for Moisture wMicking. The Relaxed Oversized Fit allows for Ease of Movement.